Corrosion-Resistant Two-Wheel Brass Rollers – Effortless operations. Removable Sashes – Safe, easy cleaning of both sashes. AAMA 2604 Powder Coat Finish – The durable finish that’s also environmentally-friendly. Fill out our form and we will be happy to give you an no obligation free quote. 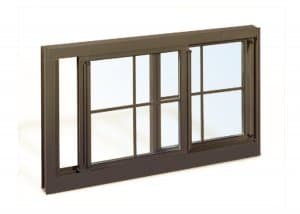 This Crystal® ThermoBlok™ aluminum sliding window features an innovative polyurethane thermal barrier technology that thermally breaks conductivity of the aluminum frame to substantially reduce thermal transfer from exterior of window to interiors, and “intercept” warm edge glass spacer technology. These integrated features reduce heating and cooling loads on HVAC systems, providing long term energy efficiency and utility savings to property owners. This series is ideal for both residential and light commercial applications. It’s value price point, easy-to-clean tilt out sashes, and coordinating architectural circle top shapes make it a popular choice with developers.choice for developers of prestige commercial projects, and upscale residential communities. Low-E Coating & Argon – Enhances energy efficiency. Nailing Fin – Designed for new construction. 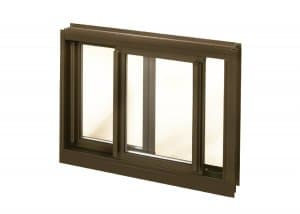 Casement Fin – Provides a fast, easy, and neat replacement.